In 1988 Professor John Gardner was at the height of his career in solid state physics at Oregon State. A world leader in perturbed angular correlation spectroscopy, a radioactive counting technique, Gardner was managing a major research group, teaching, mentoring a dozen graduate students and post-docs, coordinating and hosting visiting faculty and more when he had to put everything on hold in order to reckon with a looming problem in his life. And the joke is, Gardner told family and friends later, it did. Because when he woke up from the operation, Gardner was blind, all at once and irreversibly. For most of us, this devastating outcome might have been a catalyst for early retirement or a dramatic downshift in responsibilities. 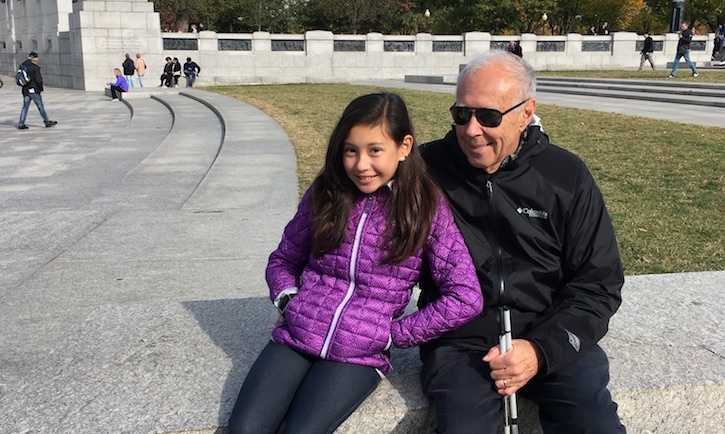 Gardner however not only found a way to continue to research, teach and mentor, but also to launch a whole new field of national research in accessibility for low- or no-sight students and researchers in the sciences. How did he do it? Gardner would the first to say that he was able to succeed, first and foremost, thanks to the help of colleagues and friends. Friend and physics professor Cliff Fairchild offered to take over the teaching of an advanced course in thermodynamics. Another friend, Bob Rasera, acted as Gardner’s eyes to examine the visual data that he could no longer see. An amazing full-time personal assistant funded by Oregon State and one of Gardner’s research grants helped him get through innumerous hurdles the first few weeks and months. Luck and available technology also played a role: it was a “very happy day” when Gardner discovered screen readers, which allowed him to read, write, edit and search text using verbal keyboard commands, bypassing hours of replaying analog recordings. As a child, Gardner could never read the blackboard, even in the first row. So he “listened a lot” and would stay after class to ask the teacher what was on the board. Tests were tricky, as the teacher wrote the questions on the black board from a piece of paper (these were the days before copy machines), but Gardner volunteered to write them for her and then raced back to his seat with her paper to take the test that the other students had already started. Growing up, Gardner did many things “a little bit” – tennis, pool, bowling, skiing and even baseball, where he always played the outfield because he could rarely see the ball coming. Creative workarounds abounded in his life, as common as dandelions and just as easy to take for granted. He even became a “fairly decent” photographer who practiced professionally for a time. Nothing really stopped him, perhaps because nobody, least of all himself, recognized any limitations. When he appeared to fall short—as when he was repeatedly criticized as a physics graduate student at the University of Illinois for not scraping all of the insulation off of copper wires in the lab—everyone assumed he was just clumsy, even careless. After his sudden blindness, Gardner continued to invent ways to not only cope, but to thrive in old and new ways. When he began to teach again, he tried all sorts of ways to visualize his lectures – writing on the board and asking the students to pipe up if his writing overlapped, projecting from his computer, even giving students notes in advance. He finally decided the best solution was simple: write on the board and erase it frequently. He also expanded a pedagogy that he’d begun experimenting with before he went blind – assigning the students themselves to teach various sections of the material because “there’s nothing that teaches you better than having to teach somebody else.” In this way, he was an early pioneer of today’s popular workshop-style classroom. His limited vision over the years may also have made Gardner more sensitive to other types of disabilities and learning styles. Dyslexic students, for example, were able to get extra time on exams, but this then caused other students to resent them for what seemed like cheating. So Gardner doubled the time allowed on the exam for all, evening the playing field. He found the results of this pedagogical experiment fascinating. “Most of the students finished in what would have been the allotted time, but a few of them remained and worked, and probably did better because they had enough time,” Gardner explained. “And the funny thing was, these were students who were not diagnosed as having learning disabilities, but they did and just didn’t know it. Just as when I was growing up, I was blind and didn’t know it. So ever since I’ve advocated for exams that allow students ample time. “If I were going to hire an engineer or a physicist, I would rather hire somebody who can do it right than somebody who can do it fast,” he added. Although Gardner found new and better ways to teach after going blind, continuing his materials research was more challenging. The data from the radioactive counting technique he used via perturbed angular correlation spectroscopy (PAC) required visualization. Without seeing the data, Gardner couldn’t “see the little nuances that tell you, ‘Oh, this fit looks pretty good, but it’s not good enough.’” While Gardner eventually did have to give up his research, it wasn’t due to his blindness (he used colleagues and students’ eyes to “see” the data) but rather the bias at the time of the U.S. Department of Energy (DOE), his main funding source. Gardner gave them many ideas – from a better way to write math equations, which were difficult to read in Braille – to many early discussions about how to make visual data more accessible. One of Gardner’s ideas was to create tactile printing. In an incredible piece of luck, during one of these conversations a computer science program manager walked by and said, “What do you mean? Tell me about it,” and then promptly wrote Gardner a check for $40,000 to cover development costs. Gardner got all the money he needed to develop his tactile printing technology from the NSF, research that eventually led to the founding of his company, ViewPlus Technologies, Inc. Founded on the principle that information should be made available to everyone who seeks it, the company broke even in 2003 and continues to succeed today despite new competitors entering the market. “I suppose imitation is a great compliment,” says Gardner. Now a Professor Emeritus, Gardner continues to work at ViewPlus Technologies and in his rare spare time, enjoys traveling several times a year. He supports the College of Science’s Summer Undergraduate Research Experience (SURE) scholarships, which allow undergraduate students to complement their academic studies with an engaging, hands-on learning experience that provides summer employment income and up to $500 of research expenses. The program relies on the generosity of friends and donors. Like many donors, Gardner is moved to give back to all of the institutions that have played a positive role in his own life, including Oregon State. Many lives continue to be transformed by Gardner’s work to make science more accessible to the visually impaired as well as his generous annual support of SURE Science scholarships. The College of Science is grateful for his generosity and inspired by his passion and tenacity. Note: Much of this article draws from a 2014 oral history interview with Gardner, recorded as part of the Oregon State University Sesquicentennial Oral History Project. The interview covers Dr. Gardner’s life and work in greater detail, including how his research in perturbed angular correlation spectroscopy jumpstarted a strong German student exchange and helped establish an international reputation for OSU physics.